Oh boy, this is yummy. 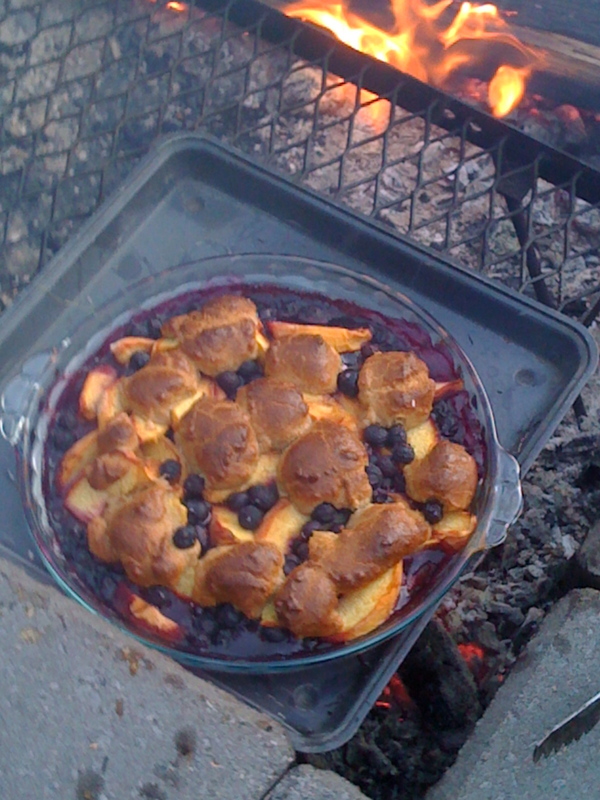 I follow a chef/writer Mark Bittman and he posted a recipe for a Blueberry Cobbler the other day. It asked for white flour and 1 cup of sugar, so I of course set out to modify it. 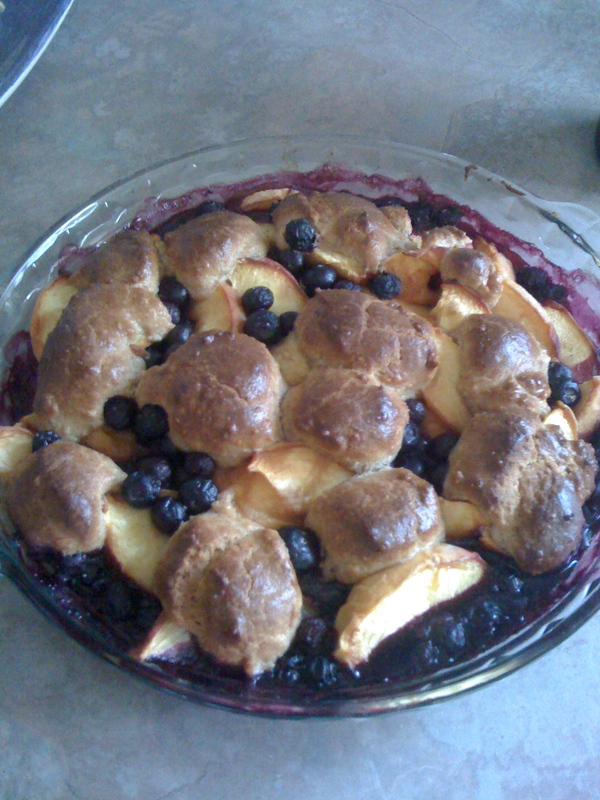 I had fresh picked peaches and blueberries from Kelowna and I was ready to experiment. If you want the original recipe, follow the link above, but for the no white sugar version, here you go. I saw no reason on adding white sugar or all that butter to it. I used honey instead and thickened it with a bit of Kuzu, or Japanese Arrowroot. Pre-heat over to 375F. Mix the kuzu water blend with the fruit and 2-4 tbsp honey. If the fruit is in season, it doesn’t need sweetening, the sugar does make the juice thicker though, that’s why I used the kuzu. Use a bit of butter to grease a pie pan or a 8-inch square pan. Add the fruit mixture into the pan. Mix the flour, baking powder and salt together. Cut the butter into small pieces, add to the flour mixture. Using a pastry knife cut the butter into the flour mixture as well as you can. Add 2-6 tbsp of honey, experiment with how sweet you like it, blend with pastry knife. If you have a food processor you can pulse the flour mixture, butter and honey together using it. Add the egg and vanilla and mix into a thick batter using a fork. I made this twice and the second time I added a wee bit too much flour so I added a tbsp of water and mixed it in. This dough is not rocket science. 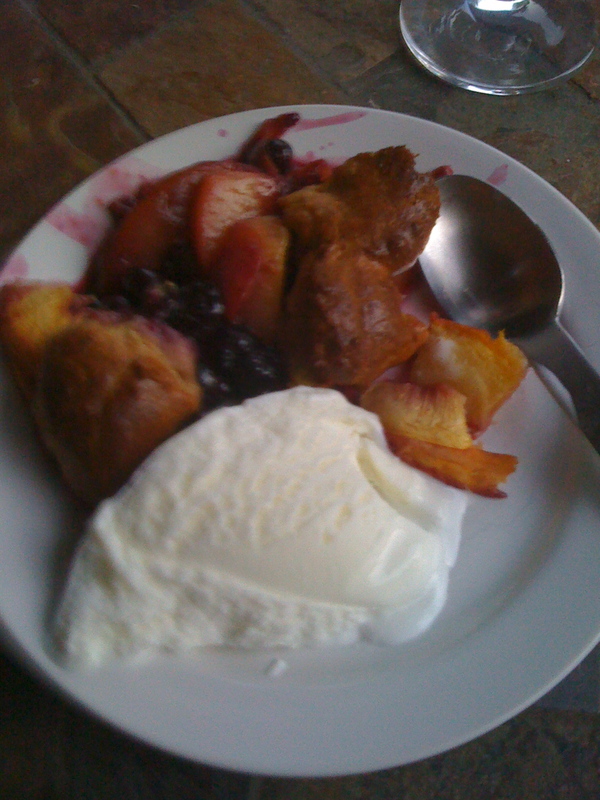 Spoon the batter onto the fruit, I agree with Mark to not spread it out, but I gave it a little push around. Both attempts were good at 45-50 min in the middle rack, but check to make sure it doesn’t get to golden. I baked the first one in my brothers oven and it got a bit over done. Let cool and set for 10 minutes or so. At my brother’s house I warmed it up over the fire after dinner! Serve with frozen vanilla yogurt like we did. Best compliment I got “Nat, this tastes clean, so good”. Just what I was going for, the fruit sang.